It is mainly wall painting on plaster. The best examples were found in Pompeii, where four different styles are distinguished and due to this they are known as Pompeian styles. The First Style was largely an exploration of simulating marble of various colours and types on painted plaster. the wall was divided into three horizontal, painted zones crowned with a stucco cornice of dentils based upon the Doric order. 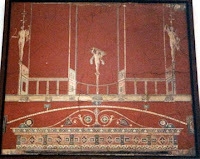 The Second Style in Roman wall painting emerged in the early first century B.C., during which time fresco artists imitated architectural forms purely by pictorial means. In place of stucco architectural details, they used flat plaster on which projection and recession were suggested entirely by shading and perspective; as the style progressed, forms grew more complex. There are visual ambiguities to tease the eye, painted masonry, pillars, and columns that cast shadows into the viewer's space, and more conventional trompe l'oeil devices. Objects of daily life are depicted in such a way as to seem real, with metal and glass vases on shelves, and tables appearing to project out from the wall. The intention of the owner was to create a kind of picture gallery, with the choice of subjects most likely based on the quality and renown of the original paintings. The Third Style during Augustus' reign, rejected illusion in favour of surface ornamentation. Wall paintings from this period typically comprise a single monochrome background—such as red, black, or white—with elaborate architectural and vegetal details. Small figural and landscape scenes appear in the centre of the wall as a part of, not the dominant element in, the overall decorative scheme. 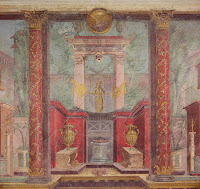 The Fourth Style in Roman wall painting, considered as a baroque reaction against the third is generally less disciplined than its predecessor. It revives large-scale narrative painting and panoramic vistas, while retaining the architectural details of the Third Style. The colours warm up once again, and they are used to advantage in the depiction of scenes drawn from mythology. 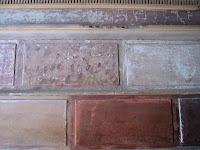 Among the technical characteristics we can signal the elaborate methods employed by wall painters, including the insertion of sheets of lead in the wall to prevent the capillary action of moisture from attacking the fresco, the preparation of as many as seven layers of plaster on the wall, and the use of marble powder in the top layers to produce a mirror like sheen on the surface. Preliminary drawings or light incisions on the prepared surface guided the artists in decorating the walls a fresco (on fresh plaster) with bold primary colours. Softer, pastel colours were often added a secco (on dry plaster) in a subsequent phase. Vitruvius informs us about the pigments used by the Roman artist. Black was drawn from the carbon created by burning brushwood or pine chips. Ochre was extracted from mines and served for yellow. Red was derived either from cinnabar, red ochre, or from heating white lead. Blue was made from mixing sand and copper, and then baking the mixture. The deepest shade of purple was by far the most precious colour, as it was usually obtained from sea whelks. Mosaic was other example of Roman art directly related to painting. These works were common in the decoration of luxurious villas and the subject represented in each of them used to be related to the function to which the room was devoted. They were made of small pieces of coloured stones that could be regular or irregular. A good example is the Villa of Casale in Piazza Armerina.